Tonight’s dinner was these delicious marinated chicken fajitas. To be honest I did not measure my ingredients for my marinade, this allows you to season according to your flavor preferences. A quick stir-fry for the meat and veggies allows these fajitas to be done in a matter of minutes. 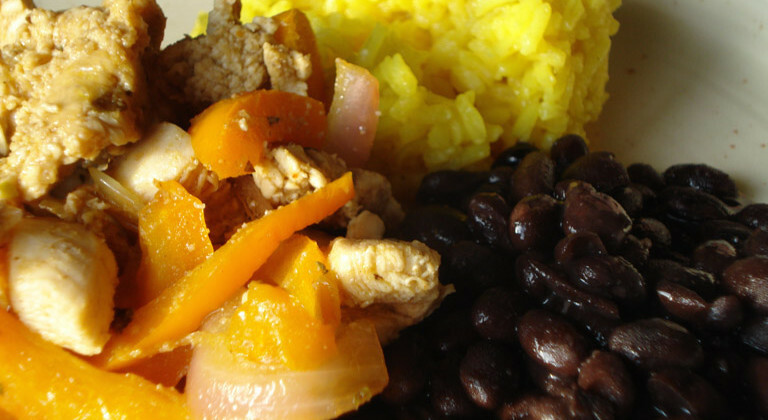 I served my fajitas without a tortilla (to save some calories), black beans and yellow rice. It was a very filling meal with less than 245 calories! As a bonus, this entire meal comes together in less than 30 minutes. Trim chicken breasts of any fat and slice thinly. Put into a dish to marinate. Add seasonings, lime juice and beer. Stir. Allow to marinade 15 minutes. Thinly slice onion and pepper, set aside. Heat wok over high heat. Add 1/2 T oil to wok, stir-fry onion and pepper for 5 minutes. Remove to separate dish. Add 1/2 T oil to wok, stir-fry chicken for 5 minutes. Discard marinade. Add onions and peppers to chicken and combine for 1-2 minutes. Serve as you wish. ENJOY!